WINNIPEG, April 1911: Michael Hrushka had $42 in his pocket when the train pulled up to the Canadian Pacific Railroad Station on Higgins Avenue. He was 16 years old, with no waiting friends, no family and no concept of the English language. A 16,000-kilometre journey from his home in a Ukrainian village had left Hrushka at the dusty doorstep of a place called Winnipeg. Along with his teenage friend, Wasyl, they departed the station and stepped into a new world, near the corner of Higgins and Main, with full hearts and empty bellies. Confused. Scared. Wondering if he should have heeded his mother's pleas to postpone leaving home until he was older, Hrushka sat down on a street corner to get his bearings. Famished from a four-day train ride from northern Ontario, they shared their meagre fare: stale bread, kovbasa and the last hunk of "budz", a cheese made from sheep's milk. "Perhaps such scenes of immigrants sitting on street curbs near the station were common in those days," Hrushka recalled, years later, in an unpublished memoir tucked away in the Archives of Manitoba. "Who cares who we were, where we were going? Nobody. We must have been looked upon as part of the dirt on the street." Yet all around them, the streets were alive, breathing, smelling of mud and horse manure. Shopkeepers paced in front of their businesses, hawking wares to passersby who could be anyone, from anywhere; weary eastern European immigrants, such as Hrushka, fresh from arrival at the CPR Station, haute world travellers from Paris, sheep ranchers from Australia, or Metis trappers from St. Laurent. On one day alone in the summer of 1912 – the apex of a young city fuelled by great expectations – 3,500 people stepped off trains in Winnipeg. One. Single. Day. Like most structures of the early 1900s, the CPR Station, built in 1904-05, was designed by Montreal architects Edward and W.S. Maxwell with the expressed intent – "dramatic portico, richly ornamented facades, grand rotundo" – of impressing new arrivals of the wealth and grandeur of what just two decades before was little more than a prairie outpost described by one modern-day historian as a "mighty dung heap". No longer. And the four-storey CPR Station, with thick limestone columns, was the Ellis Island of the Canadian prairies. Winnipeg was its New York – or would be, by unblinking consensus, in only a matter of time. Not to be outdone, Union Station at Main Street and Broadway, which was built between 1908 and 1911, was trumpeted by the Manitoba Free Press to be "The Most Modern Railway Terminal in the World." Designed by Warren and Wetmore, the architects of New York's Grand Central Terminal, the Union Station was equally designed to embrace and awe the flood of immigrants. "He (the immigrant) will be in a class by himself," the Free Press reported, "where everything will be for him..." Or her, presumably. The Beaux-Arts building's centrepiece was a cupola with a skylight over the vast rotunda. Within two years, the Fort Garry Hotel, modelled after New York's grand Plaza Hotel, opened across Main Street. The impact on newcomers was not meant to be subtle, according to Wins Bridgman, whose firm BridgmanCollaborative Architecture recently led a $6.5-million facelift of Union Station. "I think they believed they had arrived," Bridgman said. "And they looked out across Broadway (which was once described as) one of the most beautiful avenues in America. It was a place that had oculus that made you look to the sky (in the rotunda) so that you would say this is the most beautiful room as anywhere in the world." But initial impressions were not always deceiving, when looking past the Tyndall stone facades. As the teeming throngs near Portage and Main on a mid-July afternoon went about their business, young Michael Hrushka was not taken by this place. "My first impression of the streets," he wrote, "is the area was similar to a district I had seen in the capital of Bukovina. That one had a bad reputation for petty thievery, prostitution, cheat and swindle." Excerpt from Michael Hrushka's unpublished memoir (Archives of Manitoba). First impressions matter: The next morning, Wasyl woke up in a nearby rooming house to find his wallet, with every dollar he owned, had been stolen. What they witnessed was a city fast-filling with visionary entrepreneurs, pioneer dreamers and hucksters: From new millionaires and old-world penniless immigrants; a United Nations of dreamers and the displaced pouring into a melting pot of humanity multiplying at an unprecedented rate. The city, dubbed the Breadbasket of the Empire, had swelled in population from 42,000 in 1901 to 136,000 in 1911, before reaching 160,000 by 1916. From those very steps on Higgins, eating stale bread and sheep's cheese, this is the scene Hrushka would have glimpsed for the first time: Maybe one of the wives of the city's 19 millionaires adorned in the latest of French designers, perhaps stepping out of the first motorized cars navigating through mud streets. He would see a chaotic and colourful urban choreography of movement between livery animals, blue-collar labourers and well-heeled banking and grain traders. Hrushka, and thousands like him, would see and smell the bountiful goods of the original Hudson's Bay Store at Main and York, built from stones from a collapsed wall of Upper Fort Garry: "Spanish casks full of grapes packed in crumbled cork; Malagas as cool as jade, and great hothouse clusters that were deep purple beneath a frosty bloom," wrote Ruth Harvey in her memoir, Curtain Time. They would see posted flyers advertising the appearance of Charlie Chaplin at the Empress Theatre or W.C. Fields at the newly-opened Orpheum Theatre on Fort Street, the base of a vaudeville district that attracted the world's most renowned entertainers of the day. Or maybe take in a performance of Madame Butterfly at the Walker Theatre, with its inviting ivory covered walls and plush red seats. At nightfall, they would hear the ruckus from the dozens of saloons, where well-lubricated farmhands and railway workers flooded into the city to blow their wages in Main Street bars and the plentiful and welcoming whorehouses in Point Douglas, home to Madame Minnie Woods, Queen of Brothels, and some 200 ladies of the evening. But, mostly, the Hrushkas of the Old World would see and hear the omnipresent activity of construction. Or, rather, the dizzying array of unapologetically ambitious and audacious architecture that symbolized a community roiling with unparalleled optimism. "Basically, at that time, Winnipeg architecture was a cornucopia of wonder celebrating the traditions of the world," said Dr. Frank Albo, an art historian and author. "It was a city of tremendous bustle. Real bare-knuckle capitalism. It was a cross-civilization of nations and real, real building. “It was the most economically aggressive city in North America," Albo added. "It was a real estate speculator's dream. Real estate property at Portage and Main was comparable in value in square foot to Michigan Avenue in Chicago. It was a transportation hub. It was a place for risk-takers, tycoons and gamblers. And if you really wanted to make your mark as an ambitious builder, Winnipeg would be a great place to make a start." The Bank of Montreal at Portage and Main, with the world's largest vault, opened in 1914; the Union Bank, the first and tallest steel-frame skyscraper in Canada (1904); the Bank of Toronto (1905-06) with its trademark neo-classical Corinthian columns; the Royal Bank of Canada (1909) building designed by New York architects Carrere and Hastings with a rare Italian Palazzo style facade; the Imperial Bank of Canada's (1906) neo-classic stone exterior and marble, mahogany and bronze foyer. They were all part of the majestic "Bankers' Row" that featured some 20 monuments to money on Main Street from Portage to William avenues. The message, according to Albo, was ostentatiously obvious: "Guess what, soon to be nouveau-riche entrepreneurs, please deposit your funds here." Of course, it wasn't just the banks making architectural statements. In 1911, the Manitoba government announced a competition to design a new legislature, open to all architects in the Dominion. First prize: $10,000. The Fort Garry Hotel, opened in 1913, was the tallest structure in the city, based on the chateau-form style of New York's Plaza Hotel. Only a stone's throw away, Union Station, officially opened in 1912. In the early 1900s in Winnipeg, Manitoba – where the future was as open and boundless as the prairies to the West – buildings were not just erected for function. Nor were they designed using either the most inexpensive or basic materials and architects available for the task at hand. "If you want to tell the DNA of a culture – if you really want to get as close as possible to understanding the beating heart and impression of a time – you look to the buildings," Albo said. "They give you a very static, stone impression. Not flowery words." The six Corinthian columns are nearly five feet in diameter, 50 feet tall and weigh 12 tons each. Was the fourth railway station built on the site. The initial plan was to call it The Selkirk. It's actually the third legislative building. The first was destroyed by a fire in 1873. The second one opened in 1884, and was demolished in 1920 when the current one was finished. As Winnipeg's sixth post office, it was used between 1908 and 1958. It was demolished in 1962. It was demolished in 1971. The dining room of the hotel lives on in Cranbrook B.C,, where it was reassembled for the Canadian Museum of Rail Travel. Is Western Canada's oldest skyscraper. The architects also designed Grand Central Terminal in New York City. When architect Brent Bellamy casts a gaze out of the Number TEN Architectural Group building on Bannatyne Avenue, in Winnipeg's Exchange District, he points to the cluster of century-old warehouses and office buildings that – unlike many North American cities – survived the era of modernism that swept across Canada in the 1960s and early 1970s. In Bellamy's eyes, these stone edifices are stoic reminders of the one thread that passes through Winnipeg architecture to this day – the Tyndall stone found in almost every prominent building – from Lower Fort Garry to the Manitoba Legislative Building, from city hall to the Canadian Museum for Human Rights. "It defines our architecture," Bellamy said. "It defines us. This sort of heavy, solid worker buildings. It really defines the character of our city. It set the tone for what we are: Tyndall stone, masonry. "I always say if you weighed Winnipeg, it would weigh a lot more than other cities. All our buildings grew from that time." Bellamy is referring to a period in Winnipeg's history, at the turn of the century, when the buildings spoke. More accurately, they boasted and bragged. They stood over the scrambling masses of urban pioneers as symbols of progress and promise. "There was a lot of young people here," said Jim Blanchard, author of Winnipeg 1912 and former president of the Winnipeg Historical Society. "Everybody was making money, hustling. There certainly wasn't anything of the psyche of today, with a lot of bitching, negativity. If you want to build something (now) there will be 15 groups telling you why it's a bad idea. There was none of that. Everything was possible." To wit, you didn't just build a massive legislature. You crowned it with a bronze statue sculpted by Georges Gardet of Paris and cast in bronze by the Barbidienne Foundry. You didn't just build the imposing Bank of Montreal at Portage and Main, you adorned it with a solid gold leaf, which today is valued at an estimated $3 million. Assiniboine Park opened to the general public in 1904. Said Albo: "There was no issue about being chump change on anything." Why? Simple. Because Winnipeg was going to be New York. It was going to be Paris. All those historic comparisons to being a North American gateway, like Chicago? At the very least. After all, that Windy City in the minds of many of Winnipeg's all-powerful elite was a fine Midwestern equivalent for the day. But not for the future that awaited a wide-eyed community uniquely situated in the heart of rail and wheat industries, smack dab in the middle of a young continent (industrially speaking) bawling to be fed. In 1911, a newly formed Winnipeg Planning Commission anticipated the population of Winnipeg would reach 4.5 million by 1984. How Orwellian of them. More immediately, a group calling itself the Million for Manitoba League wanted a population of one million by 1922. "You can't even fathom how much we believed we were 'it'," said Murray Peterson, a provincial historical buildings officer. "We were so at the top of everything. There wasn't a facet of the economy we didn't have a hand in. And not just locally." After all, not one piece of goods, not one rail car, not one petticoat or bottle of baldness remedy came west without being carried on one of the 24 rail lines into Winnipeg. And not one bushel of wheat, piece of lumber or barrel of oil went further west without Winnipeg getting a taste. Bank clearings in 1913 were $1.5 billion. In 1909, Winnipeg handled 88 million bushels of wheat; more than Minneapolis (81 million) or Montreal (30 million) or Chicago (26 million) or New York (23 million). As author and historian Alan Artibise observed: "Nothing – neither people, nor goods, nor chattels – moved into or out of prairie Canada save through Winnipeg and the tolls levied by Winnipeg business, industry, commerce and labour sparked the Winnipeg boom." "They felt they could deliver anything. They didn't even look at Toronto," added Giles Bugailiskis, a former City of Winnipeg heritage planner. "They were looking at the eastern states and thinking we could be as important as New York or Chicago." City fathers were unabashed proponents of civic promotion. Brochures found their way to England boasting of mild winters and green acres as far as the eye could see. One report in a New York real estate publication – reprinted in Winnipeg Town Topics on July 1907 – described Canada in general (and Winnipeg in particular) as the "Middle East" of an America gone by, in terms of investment opportunity. A copy of the brochure distributed by the Winnipeg Industrial Bureau to lure business to Winnipeg in 1914. Unsuspecting Yankees were advised that the 4th of July in Canada "is celebrated as dizzily and uproariously in Winnipeg as in New York." The report also claimed friendly Winnipeg's climate "allows shirt sleeves and white lawn dresses at New Year's". That assertion might bring a smile to the faces of current-day Winnipeggers who, over a century later, still experienced frozen water pipes in June. But, hey, how else do you get 3,500 people stepping off a train in a 24-hour period in a frontier city where – in the same edition of Town Topics – a writer complains "hundreds upon hundreds of revolvers and deadly looking knives" were on display in the numerous pawn shops that lined Main Street? "And they (immigrants) get here and there's nothing but prairie grass and they're freezing their asses off," Bugailiskis said. "But nobody cared because the businesses and government made a lot of cash off them. They'd put them on a train, give them some free land and say, 'Off you go. Survive'." And so the building of Winnipeg continued, unabated. "Of the future of Winnipeg little need be added to a narrative which indicates the certainty of greatness," the Canadian Annual Review of 1912 bragged. "Geographically it is the heart of the continent and of Canada; it is the gateway of a West, which must grow to splendid proportions in production, population, and wealth; it is the capital of a Province where public prosperity and individual opportunity are manifest." To the banks of Britain and Europe, which financed the seemingly unlimited thirst for building, and to the immigrants who swarmed blindly from across the globe – either running from famine or running to their own slice of manifest destiny – it was never just about a city in the middle of nowhere, founded at the intersection of two rivers. It was always about the potential wealth that lay beyond Winnipeg, into the western frontier. So 4.5 million people by 1984? Why not? "It was an accepted practice (in the Exchange and Warehouse district) that you built your foundation for two or three more storeys," Peterson said. "They just expected to expand. There was never a question that they weren't going to go up." In 1911, more than 10,715 building permits were issued. For some perspective, Winnipeg's current building boom has included, among other projects, a football stadium, an airport, the Manitoba Hydro Building and, arguably the crown jewel, the Canadian Museum for Human Rights. At the turn of the century, Albo said, "there were projects like that in Winnipeg, at twice the scale, every six months during that time. Think of 12 Canadian Museum for Human Rights being built in a two-year period." Speculation attracted the money. The money attracted buildings. Buildings attracted architects, the finest in the Western world. Said Albo: "You have to think of it as the gold rush. Why is everybody rushing to California? Because of the gold. The gold here is our wheat, our distribution, and the location. This is going to be a place of central power. If you're a builder where are you going to go? You're going to come here. That's why they got the big guns. "They were genius designers and they weren't just coming to make a buck," Albo added. "Some of them came with a grand visionary plan. It was going to be a metropolis. It was going to have 4.5 million people living here. And, by God, we're going to do what Paris, London and New York couldn't do, which was plan it from the start." After all, while Winnipeg commerce was rooted in unabashed, old-fashioned speculation and expansion in the early 1900s, there was a parallel movement that modern residents might find foreign: The City Beautiful. Even as the original body of Winnipeg was still gangly and experiencing unprecedented growth, the Winnipeg Planning Commission members had already adopted the ancient concept that a more aesthetically pleasing and welcoming community actually creates better people. The City Beautiful Movement was born in Chicago in the late 19th century and put on display during the World's Expo of 1893. Winnipeg Mayor Sanford Evans became a convert. At its essence, the philosophy of City Beautiful was simple: a healthy, attractive, vibrant community attracted and developed a healthy, attractive and vibrant population. The concept ranged from background gardens to timeless monuments and thoroughfares, such as Washington's National Mall. But the roots of the movement stretch back as far as Versailles. "The great cities of the world had beautiful causeways and wonderful malls and open and greenery," Albo said. "They were meant to be sources of inspiration... imagining the city as a Utopia. They thought of a master plan for the city. We understand there's a master plan for sheets of music and a building. But imagine a master plan for a whole city. Broadway, for example, was Western Canada's first boulevard. 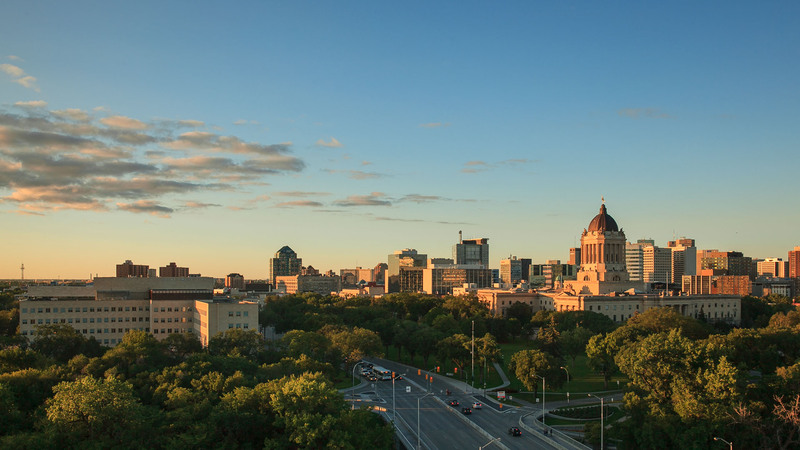 Original plans called for stately mansions, beautifully tree-lined streets and water fountains – all the way from the Manitoba Legislative Building to the Fort Garry Hotel. Meanwhile, the blueprint also included the Mall of Triumph, where the new, palatial city hall – designed but never built – was to be erected in the early 1900s on what is now Memorial Boulevard. The city hall would have been a six storey, grey Kenora granite structure, based on the design of Buckingham Palace, at an estimated cost of $2.4 million (in 1913 dollars). Meanwhile, the Exchange District and Main Street was the opulent Bankers' Row. "Similarly, these architectural dreamers believed that certain rules... had this value," Albo offered. "As someone who's been looking at this for a great deal of time, I think they're actually right. I think if you have a beautifully designed city, people will like it. And it will make them be proud of their city. It will make them not want to litter. It will make them feel a sense of comfort and joy about being a citizen of Winnipeg. "The people from elsewhere who came here with these grand visions, I think they were onto something." The fledgling city even had a subcommittee under the title of "Aesthetic Development", an offshoot of the planning commission, which help mould a proposal submitted by J.D. Atchison, one of Winnipeg's City Beautiful proponents. "Such buildings," the report stated, "will necessarily be of such importance that they will be monumental in character and of the highest standard of architecture, in contrast with buildings erected by private individuals for purely commercial purposes." The report was referring specifically to the legislative building. But also the new city hall – which represented the "city's importance as a capital of Manitoba and the commercial centre of Western Canada" to be erected at the north end of the Mall of Triumph. In fact, the first ever "Housing and Town Congress", a City Beautiful offshoot that drew representatives from across the U.S. and Europe, was held in Winnipeg on July 15, 1912. "You must not forget that some of the problems which confront you are not permanently solved," Prince Arthur, the governor general and a son of Queen Victoria, told assembled delegates. "The city is ever on the move. Where you have shot prairie chicken your sons will transact business. Where your fathers fought against indians (sic) we are standing this morning... so you must look to it that your improvements keep pace with the growth of the city and at times even show an intelligent anticipation of such growth." Hence came a push not just for majestic architecture, but – just as importantly – wide open spaces for recreation and mental health. Hello, Assiniboine Park. Hello, Grandma Elm. Behold Shoal Lake Aqueduct, the source of Winnipeg's drinking water. But here's the juicy, nasty part: City Beautiful, at its core, was a direct response – some elites thought the answer – to the real Winnipeg. The Winnipeg of countless saloons, prostitutes, rivers of flowing beer – there were six times as many bars as churches – and filthy, overcrowded slums and deadly diseases. In his book, Boy From Winnipeg, author James Gray quotes one writer who described Winnipeg as a "lusty, gutsy, bawdy frontier boomtown roaring through an unequalled economic debauch...."
"Between 1900 and 1915," Gray later wrote, in Red Lights on the Prairies, "the combined efforts of government, the railways and the freelance land agents lured more than one million immigrants to the three prairie provinces. Their coming ushered in the bawdiest, brawlingest, drunkenest, and back-breakingest era in prairie history. It was also the most puritanical, law-abiding, Sabbatarian and pietistic. It was an era in which the forces of self-righteousness collided head-on with the entrenched forces of prostitution." In many ways, there was a Faustian battle for the city's soul between the forces of City Beautiful and City After Dark, tarted up in nylons and winking at every drunken work hand who stumbled down McFarlane Street. "Those two things do go together," said Dr. Serena Keshavjee, associate professor and coordinator of art history at the University of Winnipeg. "There's all this pressure that people are devolving and degenerating... Vices like prostitution and alcoholism and drugs were thriving in crowded cities... people were really worried about that. The City Beautiful movement is an attempt to regenerate cities and make them better places. There is a morality working here. They (city administrators) are working against those vices, no doubt about it. They want to create these perfect cities to improve behaviour." "It shows you how important people thought the city was going to be. It shows you the kind of wealth we had there. It shows you the ambition. These were the big boys playing." And big girls, too, apparently. In 1912, men outnumbered women in Winnipeg 43,000 to 32,000 – not including the transient labour that migrated to town from farms and the rails. Union leaders of the day argued low wages kept men from marrying or bringing wives from Europe. They turned to drink and gambling and "women of easy virtue." Women of the oldest profession flocked to Winnipeg. According to a 1911 royal commission on vice and graft, there were 48 brothels operating in the cordoned off zone in Point Douglas, which was essentially civic-sanctioned prostitution. Noted Gray: "It shows that economic growth and prosperity were by far more important goals of a majority of Winnipeg voters. To achieve these ends they were content to have their city labelled as the "vice capital of Canada." Not surprisingly, the city was getting a reputation. A Toronto Globe and Mail headline in November 1910 blared: "Social Evil Runs Riot in Winnipeg". Chimed in the Toronto Star: "Wicked Winnipeg Wallows in Vice." In an incriminating rant published across the land, Winnipeg Rev. Dr. John G. Shearer fumed: "We have the rottenest conditions of things in Winnipeg in connection with the question of social vice to be found in any city in Canada. It is not easy to believe that such an utterly disgraceful condition of things is permitted day after day, week after week and month after month, either for love of vice and crime or on any high moral principle." “Hundreds of young girls are parading the streets of this city, flaunting their immorality in the face of the world," another city magistrate proclaimed. "The greatest evidence of the social evil in Winnipeg is to be found in the lanes and byways, in the stores, in the shops, in the homes, yes, even in the churches and Sunday schools." Worse, vice wasn't Winnipeg's greatest evil. The scourge of City Beautiful proponents, after all, were the slums that almost inevitably accompanied unfettered urban growth. In Winnipeg, that was manifested in the ghettos found north of the CPR tracks, dubbed the "Foreign Quarter", crammed with the European immigrants who lived in conditions just this side of medieval. In the summer of 1900, 330 cases of typhoid were confirmed by city health officials. By 1904, the number rose to 538. There was no drainage for hundreds of outdoor toilets, leaving what health officials described as "a lake of filth", according to the city council minutes of Oct. 31, 1904. "Should this mass of filth be polluted by the stools or urine of a typhoid patient, a conveyance of the infection to the closely crowded houses, a few feet away, must be considered as a certainty, when one thinks of the swarms of flies that must be bred in the heaps of manure and other putrescible matter, that abounds on every side," a provincial board of health report warned. "The filth, squalor and overcrowding among the foreign elements that inhabit these places is beyond our power of description." According to Artibise, the infant mortality in the North End was 248.6 per 1,000 births in 1913, more than double the rates in the West and South ends. Typhoid and smallpox were also diseases confined largely north of the CPR tracks – with more deaths in Winnipeg in 1904 and 1905 than any other city in North America. So was the early 1900s an exuberant period of unbridled optimism in Winnipeg? Sure, said Bugailiskis, with the caveat: "If you were rich and white. If you were poor and living on the other side of the tracks and didn't have running water or people hated you because you couldn't speak English..."
Consider the 1908/09 Annual Report of All-Peoples' Mission, which described one North End neighbourhood: "In 41 houses there were 120 'families,' consisting of 837 people living in 286 rooms." Was the emergence of the City Beautiful movement in Winnipeg a direct aesthetic response to the darker aspects of the urban population explosion? Albo isn't certain. But neither does he deny there was a Tale of Two Cities colliding in real time. "We do have these opposing parts," Albo said. "You have these two ontological forces, this constant driving for good or the projection of making a city good. Because there's an ethical imperative behind these buildings: If we build at this scale and this size and at this grandeur it will actually make our public better." But history records the same driving, unrelenting commercial forces that generated such spontaneous growth in a young city inevitably won the day. When it came to a choice between City Beautiful and City Profitable, the former was always the bridesmaid. One memorable editorial in the Winnipeg Telegram, in 1911, put it most succinctly: "Enthusiastic citizens orate on town planning, and the possibilities of a City Beautiful... but when the dollar is against the city beautiful, the dollar wins." In fact, in a book entitled A Social History of Urban Growth, Artibise concluded Winnipeg's shortage of housing, inadequate water and sewage disposal services – combined with the city fathers' thirst for growth (and not coincidentally personal wealth) – created a paradox. "It is rather like trying to repair, maintain, and fuel a car while pressing the accelerator to the floor," Artibise wrote. "Viewed from this perspective, the campaign for immigrants and industry stands as a monument to the failure of Winnipeg's leaders to develop a mature social conscience. The folly of the elite's overriding concern with population and economic growth made itself apparent in the social strife Winnipeg was to endure in 1919 and after." Contributors: Frank Albo, Mike Aporius, Eric Bailey, Brent Bellamy, Andrew Burton, Oliver Sachgau, Wendy Sawatzky, Nicholas Schraml, Tyler Walsh, and Karen Wiecek. Special thanks to the staff at the Archives of Manitoba, City of Winnipeg Archives, the University of Manitoba Archives & Special Collections and City of Winnipeg Planning, Property and Development.